Friday morning came, and I went to get my nails done. I figured, if I’m going to have the luxury of knowing when I’m going into labor, I’m going to look good doing it!! After this it was time to get my foley bulb placed. This was again done by an OB I had never met before, and was a really negative experience. First of all, the nurse that was helping had no idea that I was being induced for hypertension. She re-took my blood pressure because “it came out high”, and I had to tell her, “Yes, that’s why I’m here, my blood pressure is elevated.” Then she kept telling me to make sure I scheduled my 40 week appointment. 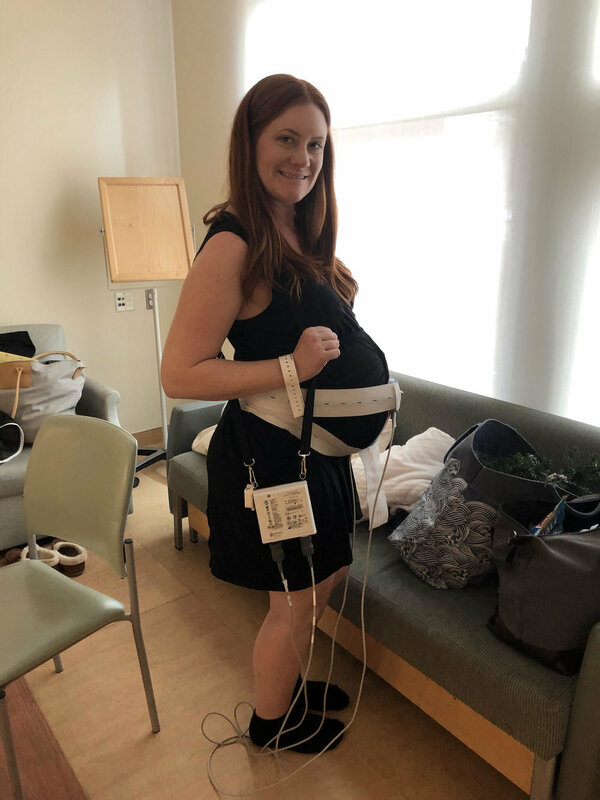 I was so angry – I’m being induced, I’m not making it to 40 weeks!! It felt like right when I had come to peace with everything, I was getting it shoved in my face that things weren’t going “my way”. The OB came in and wasn’t pleasant at all. I will never forget her. The procedure was pretty invasive, and I was so nervous. She didn’t take the time to be gentle, explain what she was doing…nothing. Even after I asked her to explain as she was doing things. Now I want to say, I have met some lovely OBs along the way. They are not all terrible and I love the OB we saw for the first half of my pregnancy. But for some reason, the last few we had were just terrible. After a painful 30 minutes or so, the foley bulb was in. She gave it a tug to test it, and it came out. WE HAD TO DO IT AGAIN. This is NOT a fun procedure. I said, I can do this one more time and that’s it. Thankfully, it worked that time and I was sent on my way. It felt very weird; I think we came home and I went straight to bed because it felt so odd to walk around! I fell into a deep sleep, something I was praying for, but awoke at 2 am to blood all over my legs. I was terrified. After talking to a L&D nurse, I found out that normally the end of the catheter is supposed to be clamped to prevent this from happening. The OB I saw neglected to do this. She had also forgotten to tell me that I needed to gently tug on it every hour to help it do its thing inside of me. Ugh. Our first day at the hospital with all of my hook-ups…you can tell it’s the first day because of how good my hair looks LOL. The next morning was so strange. We were packing up to go to the hospital, but I wasn’t in labor. We always imagined the drive to the hospital to be stressful and exciting, and instead it was calm and odd. It felt so wrong, so unnatural. This wasn’t how it was supposed to go, I thought to myself. I was still struggling (again) with the induction. Well, I should say I had come to terms with it, but still allowed myself to feel the disappointment. We got to the hospital and got checked in. Everyone was so kind, and really honoring of our desires. We set up our room with a mini Christmas tree, flameless candles, and fairy lights. The entire stay, every nurse who came in absolutely loved our room. We did it for us, and I do believe it helped us feel peaceful and more at home, but I also believe it positively impacted the nurses and midwives too. It was magical. The first order of business was taking out the foley bulb. That was so weird! The nurse just tugged a little and it slid out. A midwife, Marnie, came in to check me and I was 2 cm and 50% effaced. The next step was to start Misoprostol, which was given to me every 4 hours. No one told us this right away, but this was never expected to put me into hard labor. It was just supposed to soften my cervix in preparation for the stronger drug, Pitocin. So on December 22nd, I took this pill every four hours, your dad and I watched a Harry Potter movie marathon, and we walked the courtyard of the hospital. It was a full moon, and I had always thought the full moon would have something to do with your birth. The night was so cloudy, but the moon peaked out perfectly right when we went out for a walk. Maren’s Moon, we called it. After my uterus “calmed down”, we started Pitocin. Overnight, I got quite high on the amount they can give me (12 units, the top being 20) but still, no productive contractions! The monitor showed them all over the place but I couldn’t feel them. I told the nurses, “I have never wanted to feel pain more!” They ended up turning down the Pitocin while I slept because they were worried that it was over-working my uterus. Overnight I had the midwife that I had seen at 36 weeks, Jonie. She was great as well. In the morning, she mentioned to me that she didn’t understand why I was at the hospital for hypertension. My blood pressure was fine the entire stay, and my body clearly wasn’t ready for labor since the drugs weren’t working. After she mentioned that, the new nurses for the day also came in and told us that the doctors were wondering why I was there. How frustrating!! I felt like screaming, “This is what I’ve been saying all along! 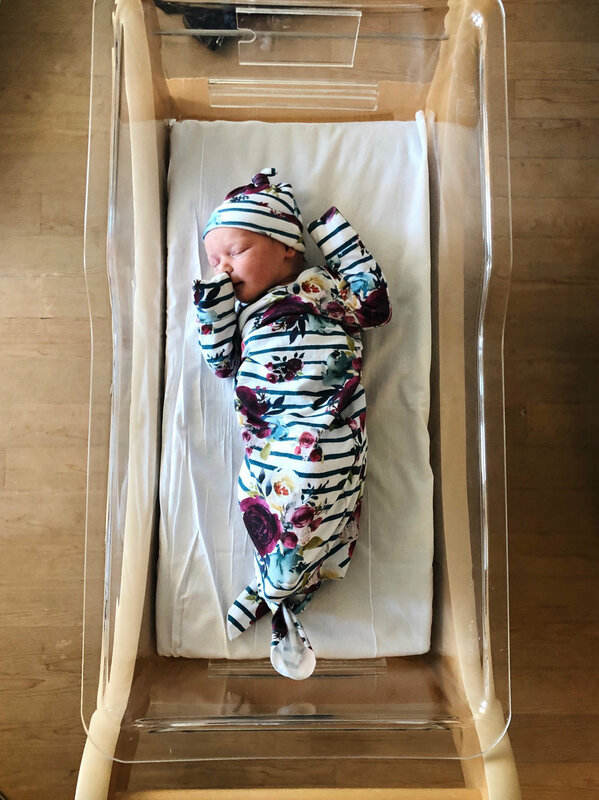 I never needed to be induced!” However, we were also hopeful for the chance to be home for Christmas (it was now the 24th) and to give my body a chance to go into labor on its own. I wanted to press restart. The new midwife came on, Marcie, and we discussed this with her. She explained that she didn’t think we should go, and the doctors were apparently torn as well. Too much of a liability probably. She, instead, wanted to break my waters to get things going. This was a really hard and scary decision for us. Once your water is broken, you are on a timeline. If my body didn’t go into labor in 18-24 hours, it would be C-section. We took all day to pray about it, and had a long discussion with Marcie. Ultimately, I felt like I had now been in the hospital three days, and if I had to wait another day for my baby I was going to lose it. We felt at peace with the decision to break my water. I should probably mention, she did strip my membranes twice throughout the day which can sometimes get things going. But it didn’t. When she checked me before breaking my water, I was at 4cm and 70-80% effaced. Wow!! Almost half of the work was over and I never felt any of the contractions that did the work. We were ready. Very, very soon after my water was broken, I felt strong contractions. This part is very blurry to me – I was in hard labor, FAST. It had probably been 5-10 minutes. Pitocin was at an 8 at this point, and I begged the nurse to turn it down. I remember telling her that I felt like I had no breaks, but she looked at the contraction monitor and told me that it looked to her like I was having 2 minute breaks and that that was perfect. I was so mad! The hardest part was that the labor position I had practiced was so uncomfortable, and near impossible, because of the monitors on my tummy. None of the labor positions we had practiced were comfortable. I panicked!! I had no idea what to do with my body. Nothing was working. I ended up sitting on the birth ball and leaning over the bed. We had practiced dad massaging me, reading me affirmations, and coaching me, yet now that I was in the moment I wanted silence and no touch. Everything was different than I had practiced! Here in the first 2 hours was when I was freaking out about the pain the most. I really believe it was just because I didn’t know how to cope now that none of the things I had practiced felt good. I thought to myself, I’m going to need the epidural. It didn’t help that my nurse was a big fan of the epidural. She kept getting in my face, saying “Nothing is set in stone” and offering me pain relief (even though I had told her that I will ask for relief if I need it, and to not bring it up to me). I ended up asking for the “TENS unit”. It shoots electricity through your back and it’s supposed to take the edge off. It didn’t do anything for me, and it was just another cord coming off of me and getting in my way. Marcie came in and was so excited to see me in labor. I think I grunted at her, and could have slapped her smiling face. Haha! But she suggested I get in the shower, and that sounded great. I also had been feeling nauseous, and didn’t like the idea of throwing up in front of everyone. I thought it would be great to be alone and throw up in the shower. I got in (with the stupid IV pole right outside of the shower and all of my cords leading out to it) and labored away. I loved turning the water on really hot, and then during a contraction turning it cold. I also continued to feel like I needed to throw up, and made it my mission to throw up in there. Throwing up in labor can help things propel forward, and can be a really good sign. But I HATE throwing up and was terrified. I kept telling myself, “Get out of the way of your body. Let your body do what it needs to do.” It never happened. After some time, Kyle came in to check on me. I was really starting to have a hard time, and I was moaning through the contractions. I decided, this is really hard and I think I need something to help. It wasn’t that I wanted an epidural, but I thought maybe I needed to start thinking about thinking about having an epidural, lol. I got out and asked to be checked. I had decided that if I was “far along” (I don’t even think I had a number in mind) I would keep pressing on, but if I wasn’t very far, I would think about pain relief. I was at a 6. The whole room was so excited, but I was discouraged. I think I wanted to magically be a 10 or something. I asked for the nitrous. It, just like the TENS unit, did nothing for me. But the midwife had mentioned that it can make you nauseous, and since I wanted to throw up so bad, I wanted to give it a try. Maybe 30 minutes later I began to have convulsions that I thought was me gagging. I would kind of grunt/cough into the barf bag and simultaneously pee all over. (Yep - birth is pretty glamorous). I did this many times, wanting so badly to throw up. Your dad felt so bad for me. After doing this for some amount of time, I all of a sudden realized…I’m not gagging. I’m PUSHING. I told Kyle and he called the nurse. Once I realized that’s what I was doing, it took over and I couldn’t help it. The nurse tried to get me on all fours and applied counter pressure to my hips because she thought I was having intense pain, but nothing could stop me from pushing. I remember thinking, “I’m not in PAIN, I want to PUSH!” Seriously, once I realized I was ready to push, the pain disappeared. We were all nervous because I had just been a 6, and that was too early to push! I was begging to be checked again. The nurse finally checked me again and I was an 8-9. That’s all I needed to hear. I was pushing you out. 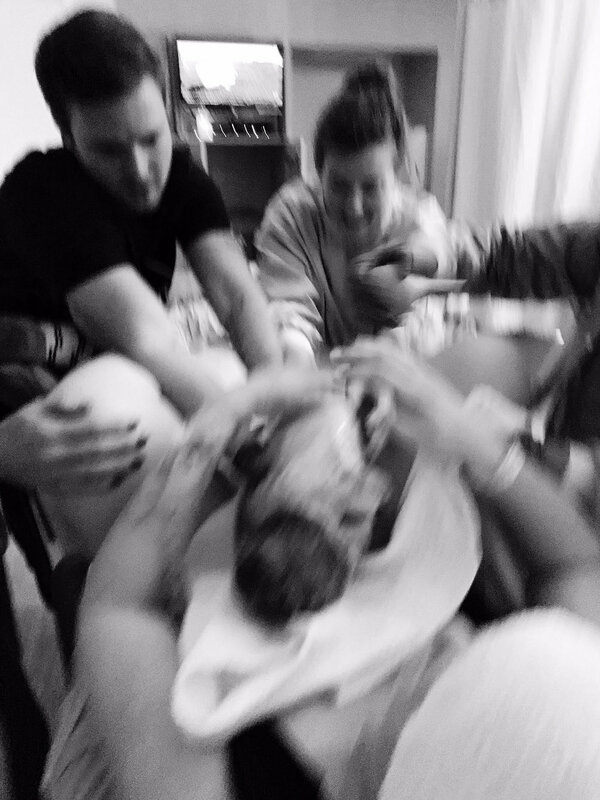 The most amazing moment…thank you to my mother in law Treacy for all of these photos!! Everything changed so fast. I mean, as soon as your grandmas were heading home for some rest, thinking that it’s going to be awhile, your dad was texting them to come back! Pushing, for me, was not painful. It took every part of me and was exhausting, but it wasn’t painful. I kept picturing you passing under my pelvic bones (you were rocking back and forth there for a bit), and everyone would get so excited when your head would surface momentarily. I originally planned to give birth in the squatting position (which was one of the reasons I wanted to birth naturally - you can’t do this when your legs are numb), and your dad was so good about asking for the squat bar once I was starting to push. However, it was not comfortable for me! I couldn’t relax in between contractions in that position, so the midwife had me in a sort of modified squat on the bed so that I could lay back in between contractions. You were so low at this point, but for some reason I felt like you were pushing on my lungs and I never felt like I could truly BREATHE. That really motivated me, I hated that feeling, and I was pushing so much that the midwife had to tell me to stop! She was like, “Arielle, I believe you will push this baby out on sheer willpower but you need to rest in between contractions.” Haha! She caught me. I was definitely pushing “wrong” at first, but she was really good at coaching me and once I was getting it right it felt even more natural and good. Pushing is one of those things you can’t practice! Earlier when my water had been broken, the midwife let me know that it was clear which means that you hadn’t passed meconium yet. That was great news. However, at some point during pushing, I heard the midwife say to the nurse, “Was that mec?” I knew what that meant. However, I trusted you and trusted my body, and wasn’t worried that you would swallow the meconium. Your heartbeat always remained so impressive and healthy, and I had a feeling you would be out soon after that. After a total of 2 hours (that felt like 30 minutes), finally I could feel that your head was partially out! Your dad got into position to catch you. It took one strong push and your entire body slid out. I exclaimed, “Thank God!” It was such a relief. All of the pressure down there was gone. I could breathe again. And you were safely on my chest. Our little Christmas gift, born at 1:46 am. Part of me wishes I would have trusted my instincts and denied the induction, but the other part of me sees so much beauty in how your story turned out and wouldn’t have it any other way. No, I did not want to be in the hospital for 3 days and I did not want to be laboring with a million wires coming off of me. But the process of accepting the induction and surrendering to God taught me such a valuable lesson in trust. I would never take back that week before the induction and all of the highs and lows that brought you here.